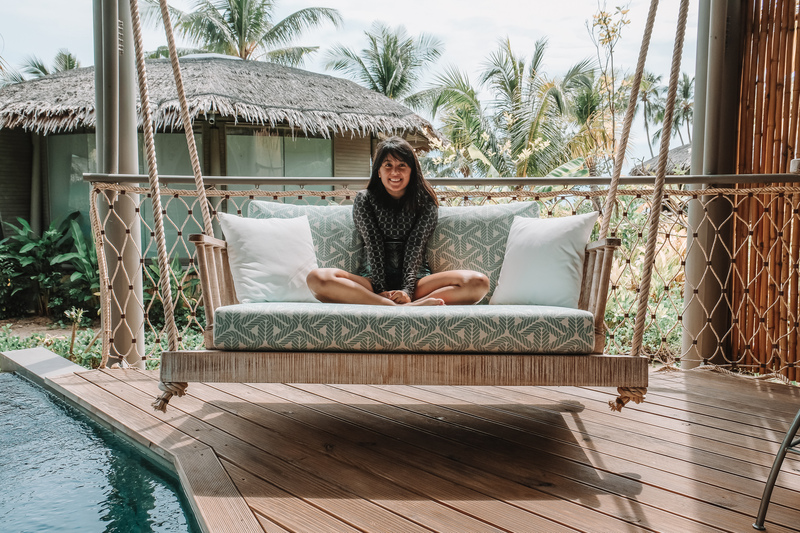 Treehouse Villas is a secluded island resort that combines modern design elements with breathtaking views and rustic surroundings. 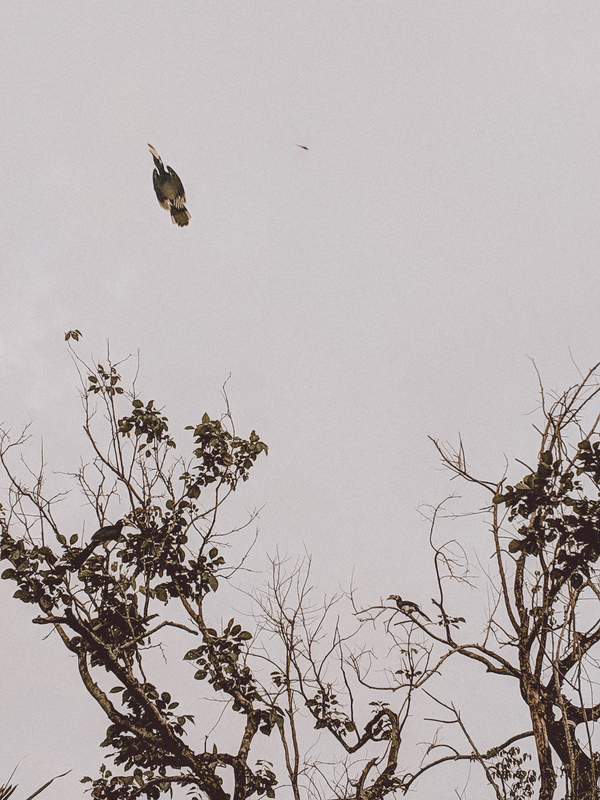 It’s not at all the type of place where you drop your bags and come back to crash at night— your room is the destination itself, which is exactly my kind of place. 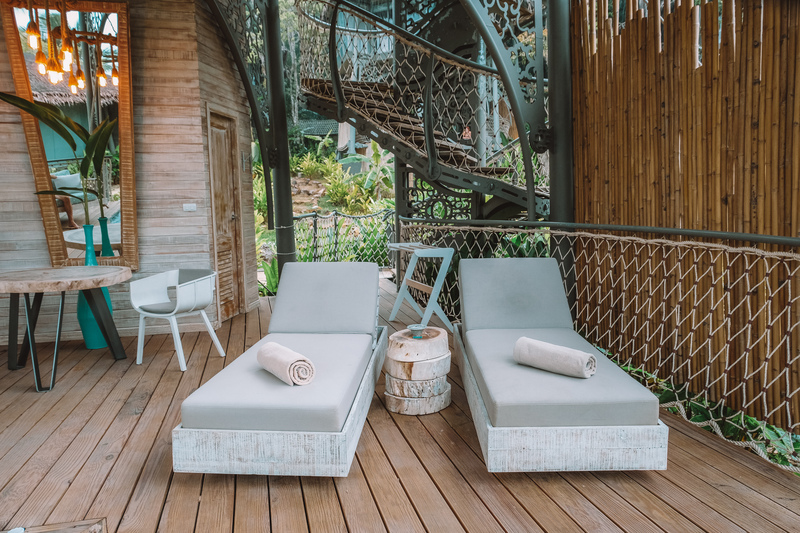 Though the resort is slightly out of budget and more expensive than our usual fare featured here on The Innbox, I’m making an exception and telling you about Treehouse Villas for a couple of reasons. 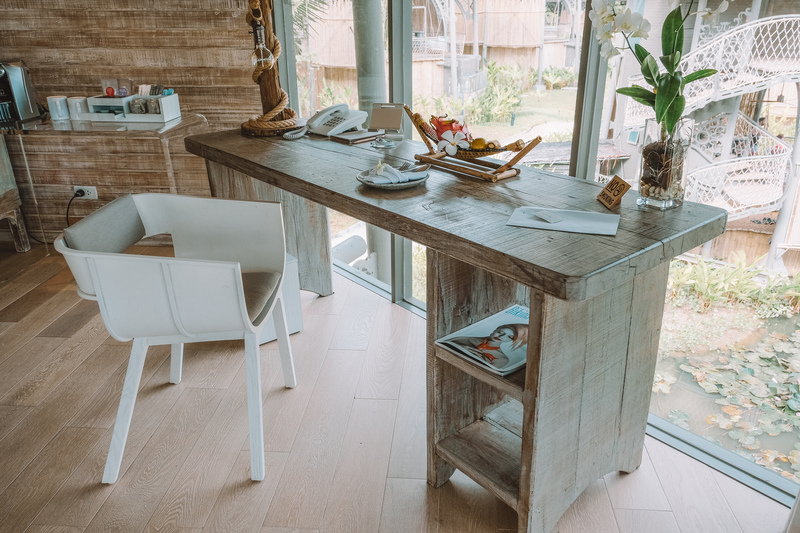 The first is that I paid for Treehouse Villas entirely with credit card points, so not from not spending cash on this stay, I find that this makes Treehouse Villas slightly more accessible than competing resorts in its price range that don’t list themselves for credit card point redemption. I personally booked my stay via Chase’s rewards portal, and basically used the points I had accumulated from the rest of the year booking hotels and flights with my Sapphire Reserve card (which I highly recommend to anyone who travels or dines out frequently). The other reason is, I am someone who actually has a hard time redeeming my credit card points. I’m an accumulator, not a spender. Sometimes it’s hard to find something worth spending all those precious points on, especially since I don’t often want to stay at super expensive hotels. 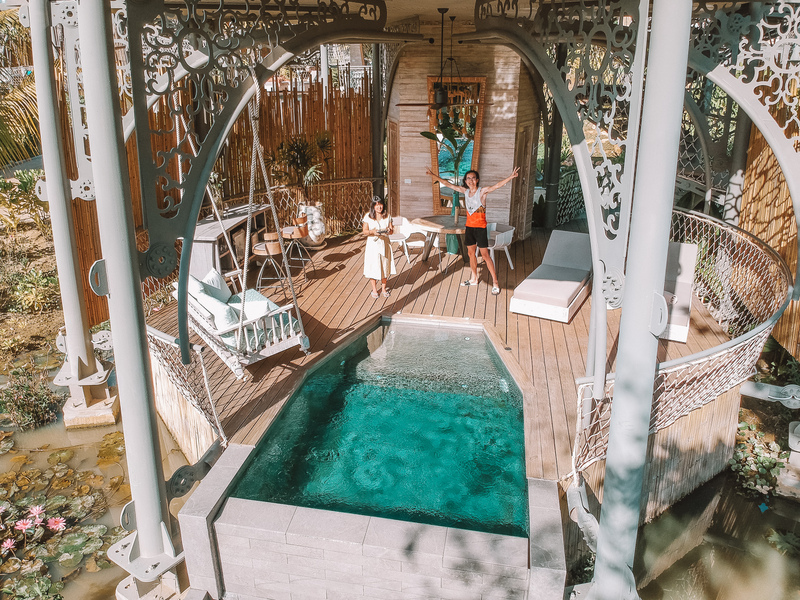 However, Treehouse Villas hit this sweet spot of being just too expensive for me to spend cash on, affordable enough to not wipe out all my points by booking my stay there, and also felt like a true “reward” or high value place to redeem my points on. 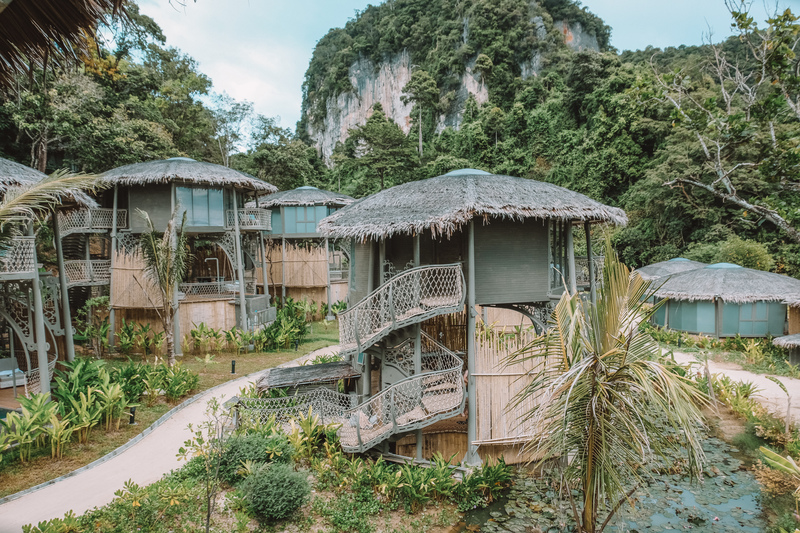 It’s a treat-yourself kind of place, the kind you book for a special occasion, and our last major trip in Southeast Asia seemed like as good of an occasion as any. Lastly, there are just some places that are just so inspirational (or notorious, like Marina Bay Sands) that they’re worth sharing. 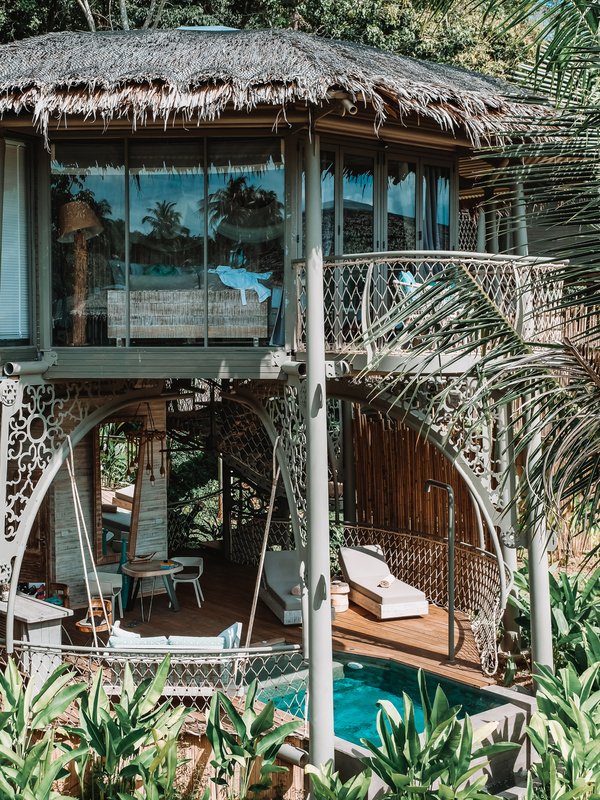 Especially since Treehouse Villas doesn’t seem to get nearly as much press as other resorts in southern Thailand. Which may be because of it’s location on a sparsely populated island, but in my opinion that’s what adds to the charm. 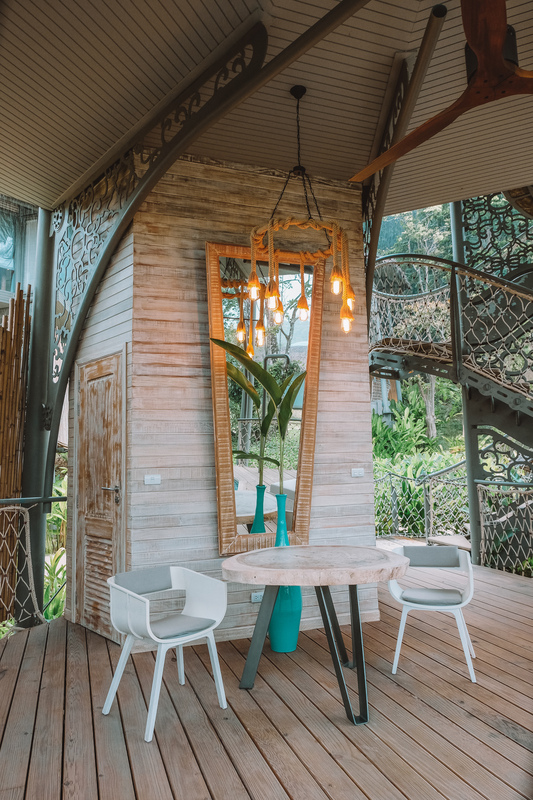 If you’re looking to do something a little different than follow the standard itinerary for your trip to Phuket or Krabi, Treehouse Villas is certainly off the beaten path. 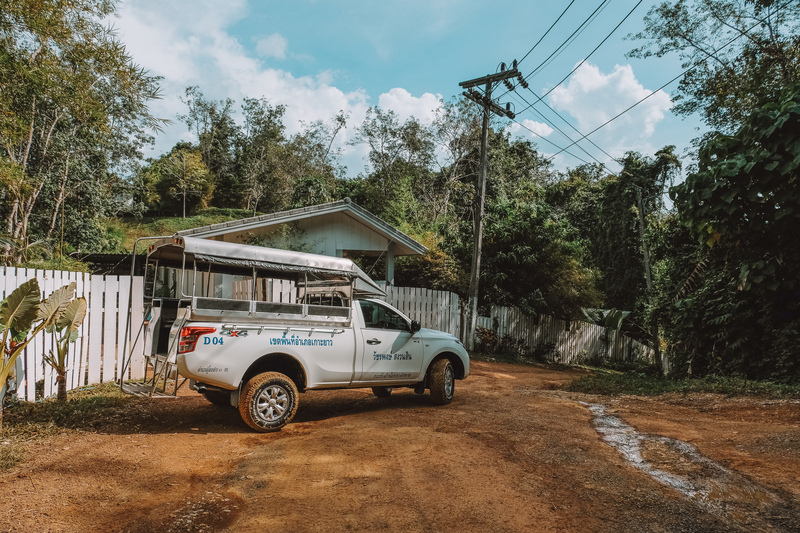 Let’s get this out of the way: because it's off the beaten path, there is no great way to get to Treehouse Villas. It’s located at the tip of a sparsely populated island in Thailand’s Phang Nga Bay, enclosed on three sides by dense forest and mountains and on the other by silvery ocean waves. This contributes to the resort’s remote “land’s end” vibe but also leave you with two options: the cheap option or the expensive one. 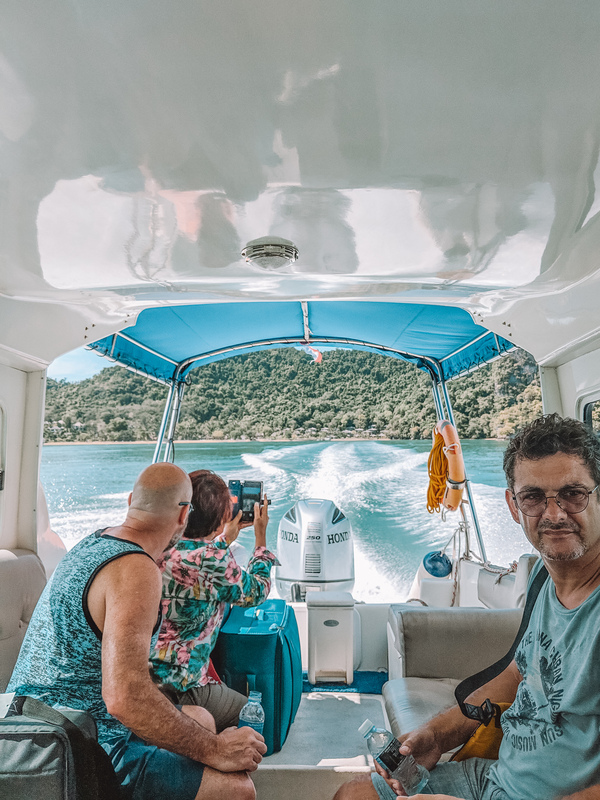 We chose the cheap option on our way there and pretty quickly came to the realization that it was worth shelling out $50 for the direct speedboat and van transfer to the airport on the way back. 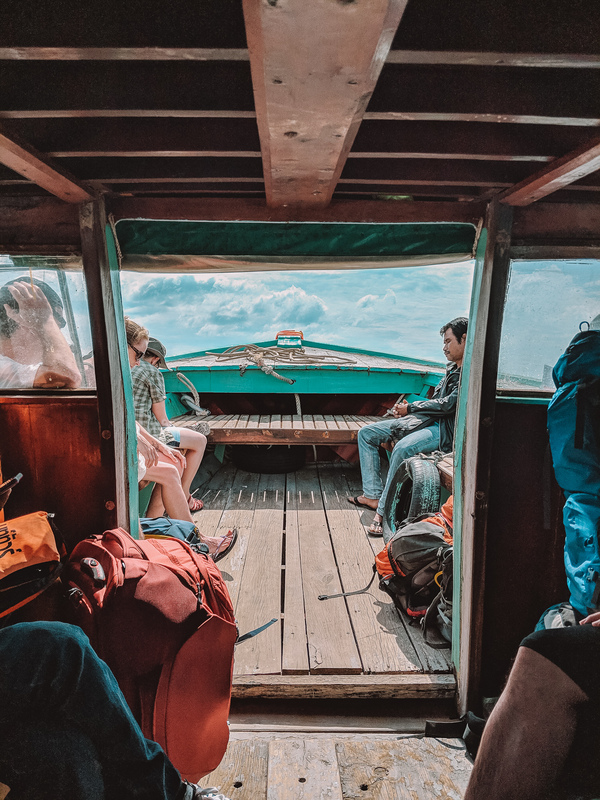 If you go with the cheap route, assuming you’re coming from Ao Nang/Krabi (which is what we did— the other option is to get there from Phuket) you can take a taxi to Tha Len Pier and then hop on a ferry or speedboat to Koh Yao Noi from there. 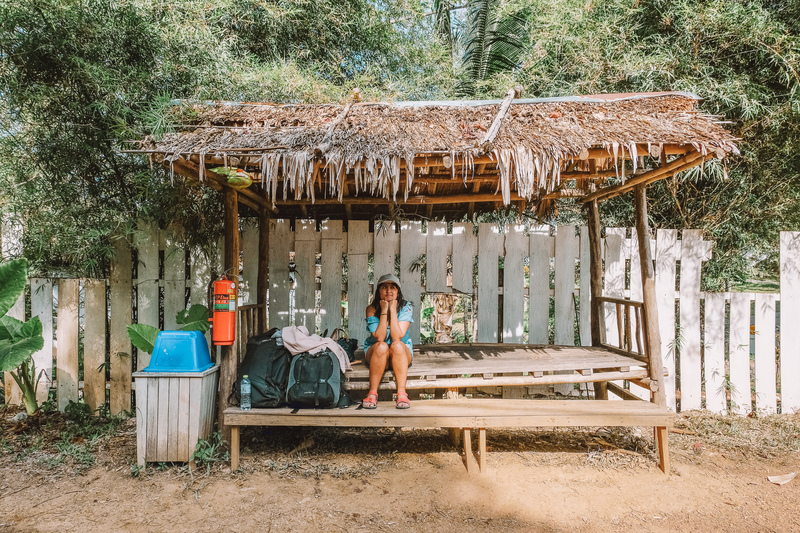 The ferry should cost about $5 per person and will drop you off at Tha Khao Pier on the central east coast of the island, and from there you’ll need to grab a taxi or songtaew to take you to the drop-off point for Treehouse Villas. You can find more information on how to get there from both Krabi and Phuket here. The cheaper ferry on the way there vs the more expensive but direct speedboat on the way back. Entryway surrounded by foliage; compact lobby with seating area; hallway leading to the rooms. 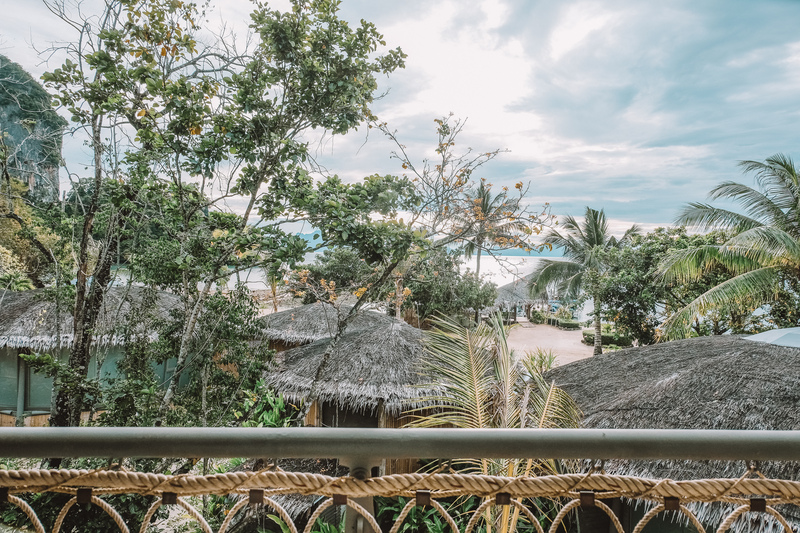 But after a five-minute drive through Treehouse Villas’ sister resort (the more family-friendly Paradise Resort), you pull up onto this view and well... enough said. I was bursting with anticipation to finally see our villa in person and it did not disappoint. 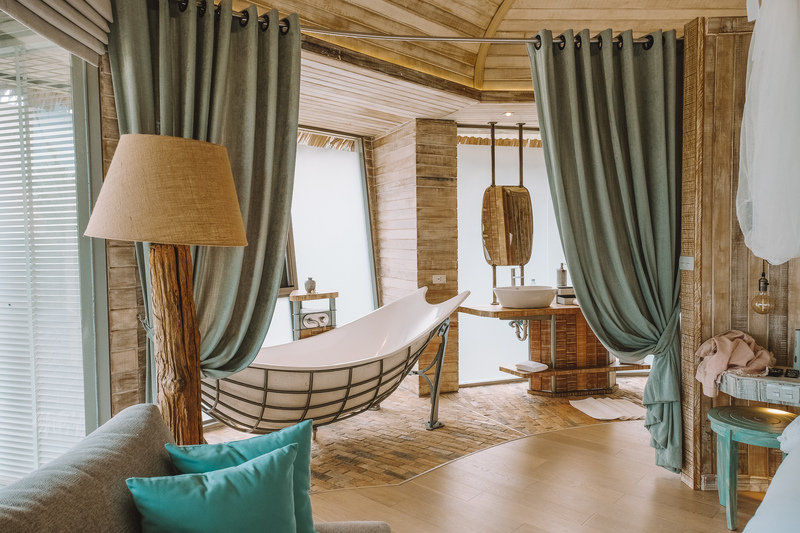 Upon stepping into the open-air first floor we were immediately greeted with the sight of a refreshing turquoise plunge pool, the crowning glory of this modern treehouse. The small pool has an infinity edge, overlooking the surrounding pond which is filled with lotus flower and monitor lizards. 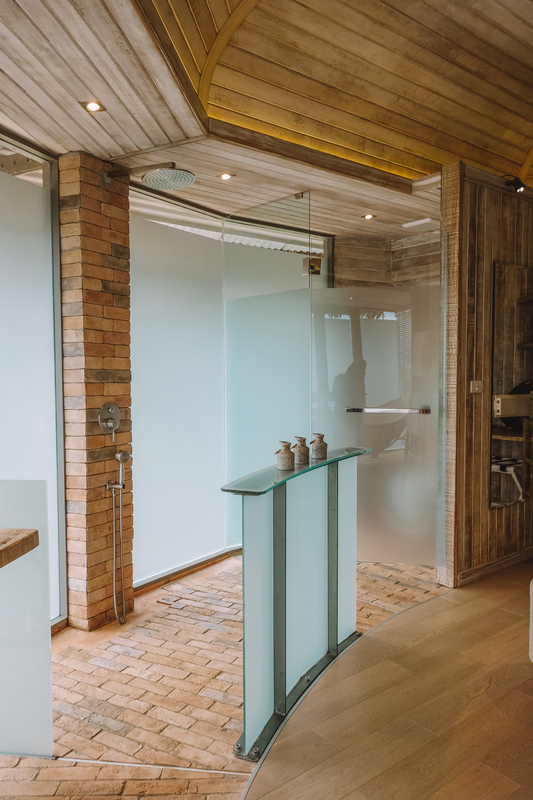 The first floor also includes a bathroom, cushioned reclining deck chairs, a bar, a cushioned swinging bench, a little cafe table, and a shower for rinsing off. It’s basically the perfect little pool house set-up and we spent most of our time here hopping back and forth between the pool and the swinging bench. Panoramic view of the first floor, and detailed photos of the amenities. Moving up the spiral-ish staircase to the second floor, we enter the enclosed bedroom and bathroom space of the villa. At the entrance is a long desk (although seriously, I can't imagine coming to a place like this and spending too much time at the desk) while the center of the room is anchored by the king-size bed. Across from the bed is also a smaller outdoor balcony with a cute cafe table and chairs. King-sized bed, spacious work desk, view from the balcony, and view of balcony from inside the villa. 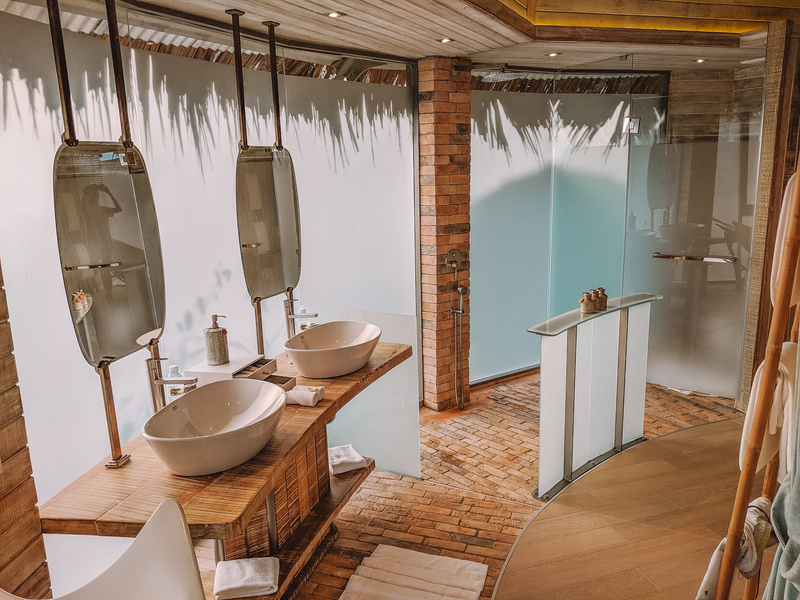 Though it maybe "treehouse" inspired and located in the middle of the jungle, this was probably the most luxurious bathroom out of all the places I stayed at in 2018 (as I noted in my year end list). 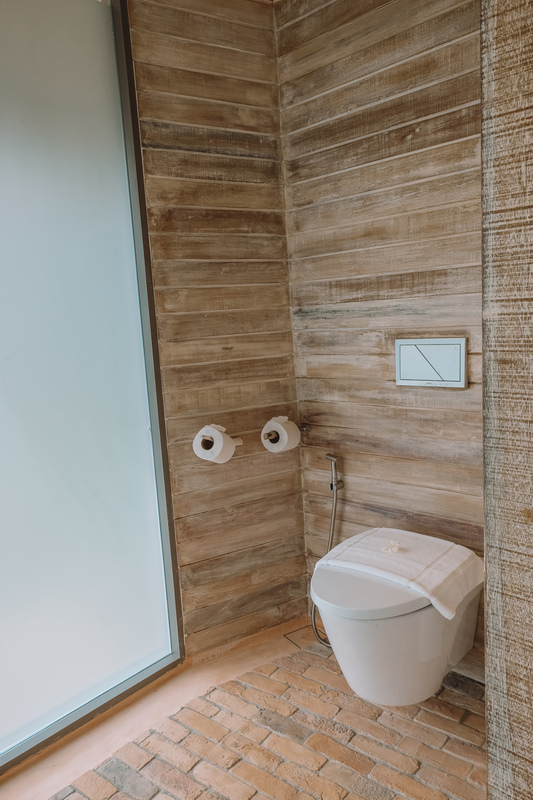 The wrap-around layout of the bathroom makes it feel spacious, almost like it goes on forever— and the frosted windows let in a beautiful amount of light whilst maintaining privacy. The bathroom is separated from the bedroom space by a pair of curtains, on the other side of which is a rather unique, almost science-fiction inspired bathtub. While the tub looks cool as heck, it is deceptively small and only fits one person. 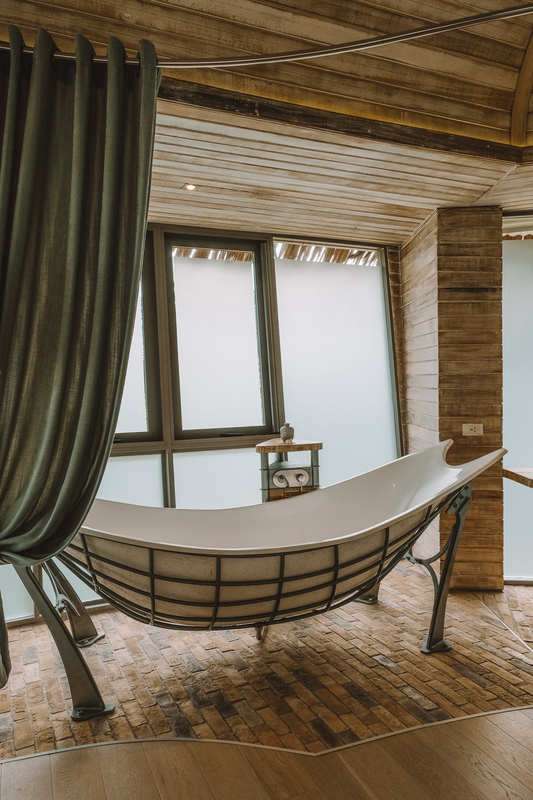 Which wouldn't be a huge deal (and a non-issue if traveling alone) but frankly it's not even as comfortable as some of the more traditional tubs we used. That said, the windows directly next to the tub do open up, providing a lovely atmosphere for a nighttime soak. 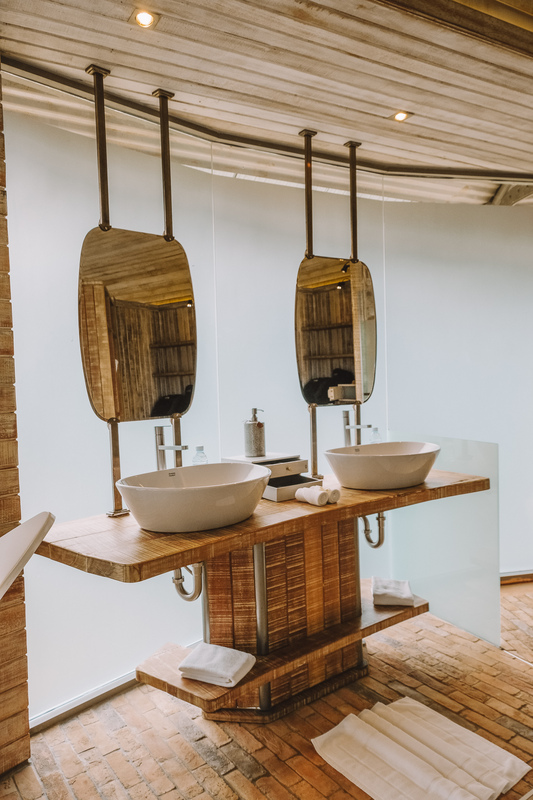 Following the bathtub is a pair of sinks (and some heteronormative-ly grouped toiletries, which is not great) with a spacious wooden countertop and mirrors. Past the sinks are my favorite feature in the bathroom, an open air shower divided from the rest of the space by a thin glass counter that offers up shampoo, conditioner, and body wash in cute little ceramic jugs. Next to the shower the toilet is enclosed in its own room with frosted glass walls. Open-air shower, bathroom stall, vanity, and walk-in closet. Opposite from the toilet stall is a vanity nook with a tufted stool, two mirrors, and plenty of storage place for jewelry and other toiletries. 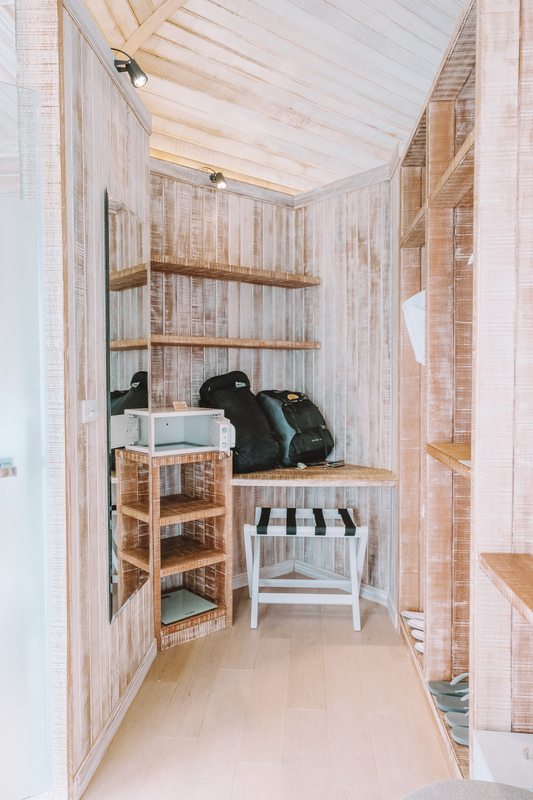 At the end of the bathroom is a spacious closet area with more than enough space for storing luggage and unpacking your entire suitcase. 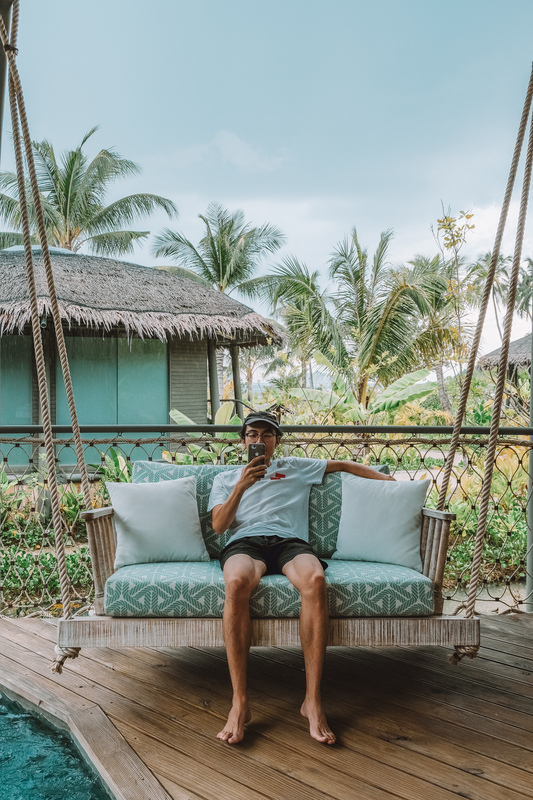 To be honest, this is one of those places where our private quarters were so good that we didn’t really need to spend much time in the resort’s common areas. We took all of our meals in the hotel’s lobby / open air dining area (more on that below) and did pop in the sauna, located under the communal pool, for a few minutes. 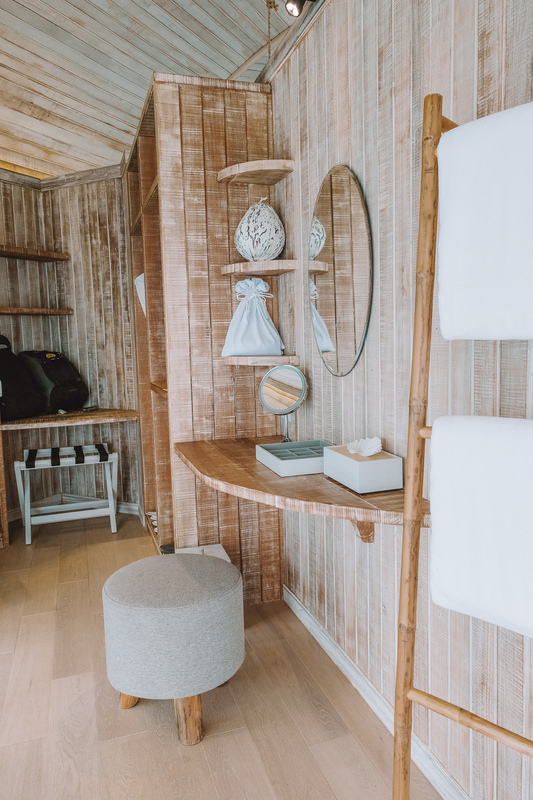 Treehouse Villas also has a convenient set-up where as a guest you can also access amenities at the sister resort next door, such as a rec room, gym, more restaurants/bars, and games. Funky plants and walks along the beach. However we took most advantage of the grounds with long walks to soak in the natural beauty of the surrounding area. 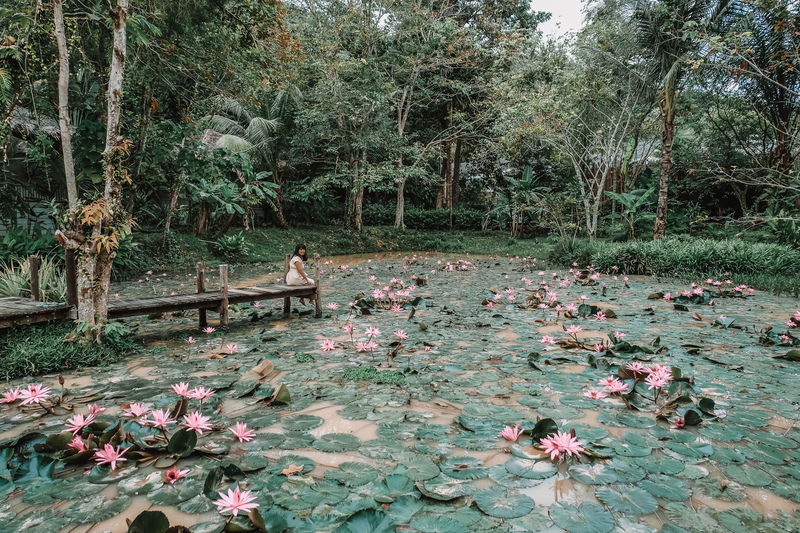 A five minute walk away from our villa and onto the neighboring resort’s grounds is a beautiful lotus pond beside a small rice field. It’s a great spot for a photo-op, but you’ll want to go in the AM to take advantage of the lotus flowers in full bloom (they close up at the end of the day / night). The perfect spot to reflect (or sing Reflection to yourself). 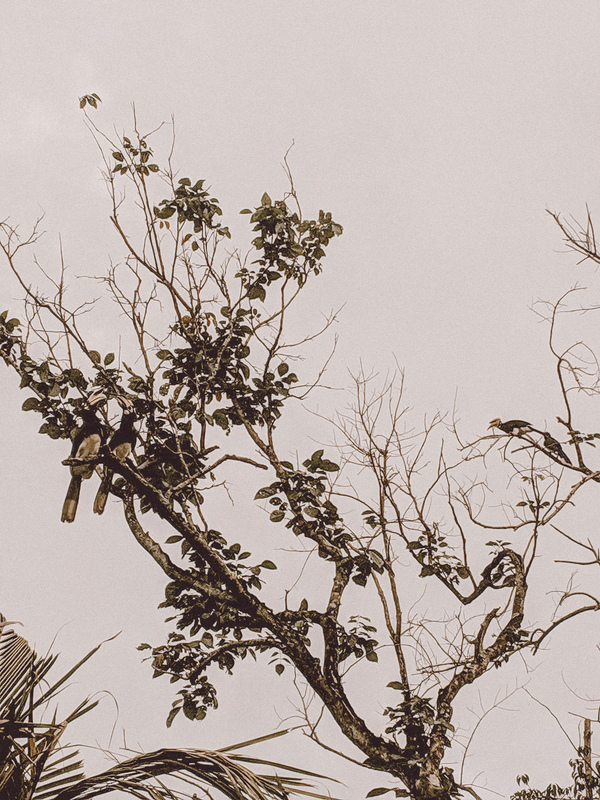 Back on the Treehouse Villas property, if you take a walk along the beach during low tide and head towards the mountains on the left side of the grounds, you’ll find a large family of hornbills hanging out in the low tree branches. 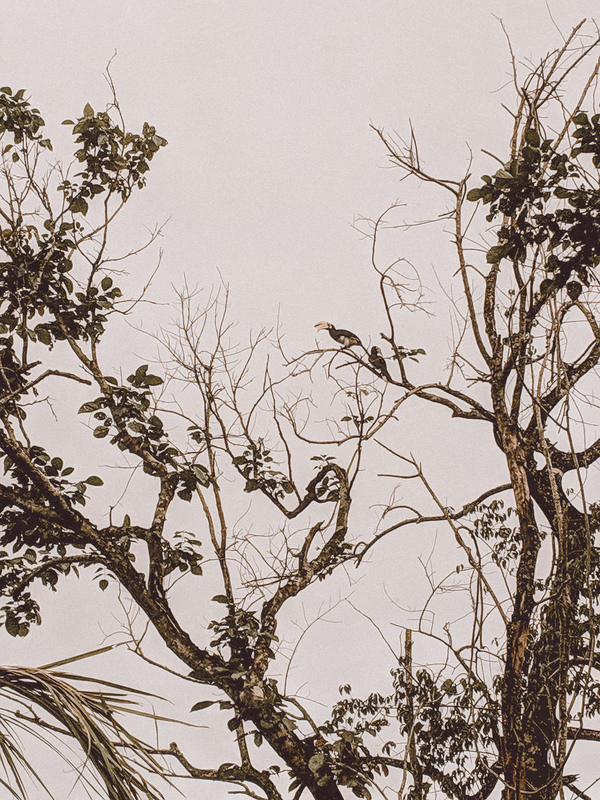 We happened to be taking a walk around there during their feeding time and got to watch the birds swoop away from the mountains and closer to the beach to peck for insects in the now accessible sands thanks to low tide. 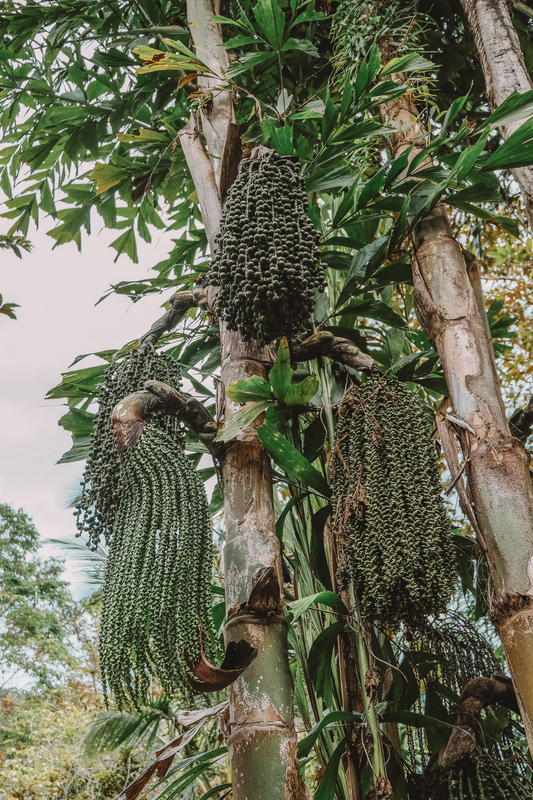 It was truly memorable to witness in person, and one of the elements that makes Treehouse Villas feel integrated into the surrounding nature despite its polished resort looks. 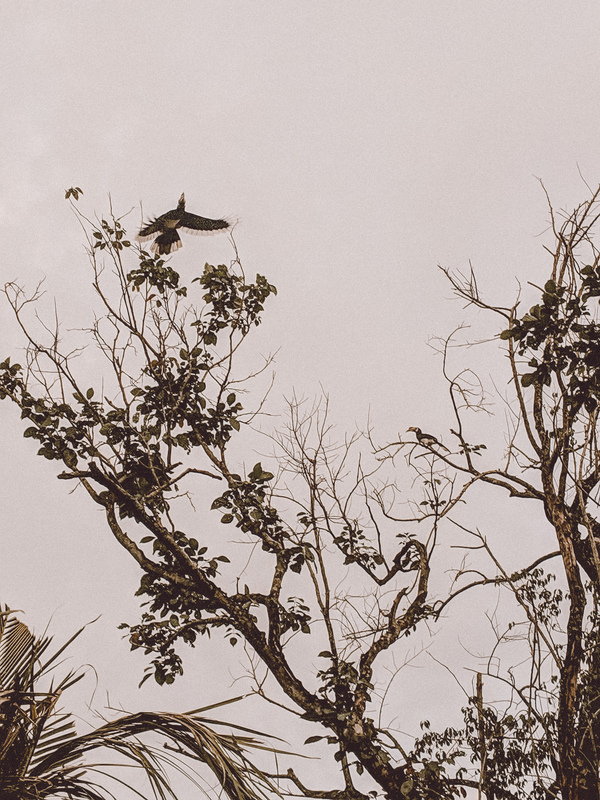 Hornbills getting their life on Koh Yao Noi. 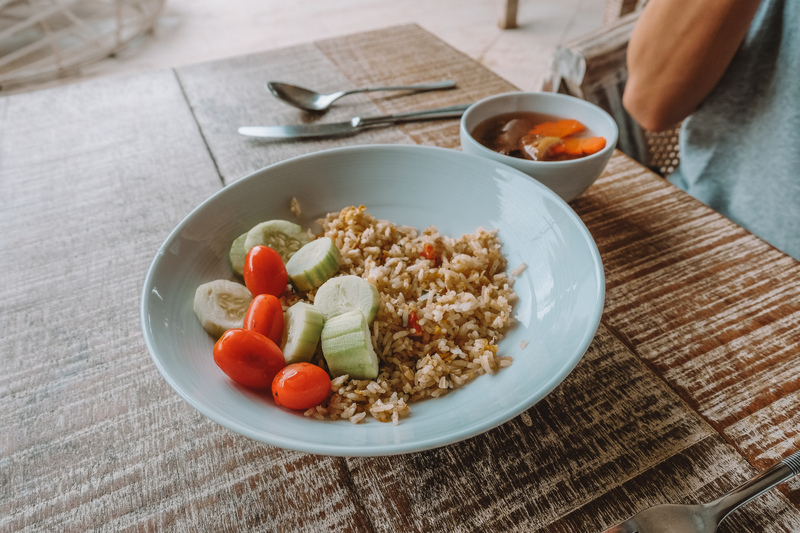 The food at the resort was kind of hit-or-miss, as is the case with most resort food. Breakfast, which was included with our stay, was terrific. 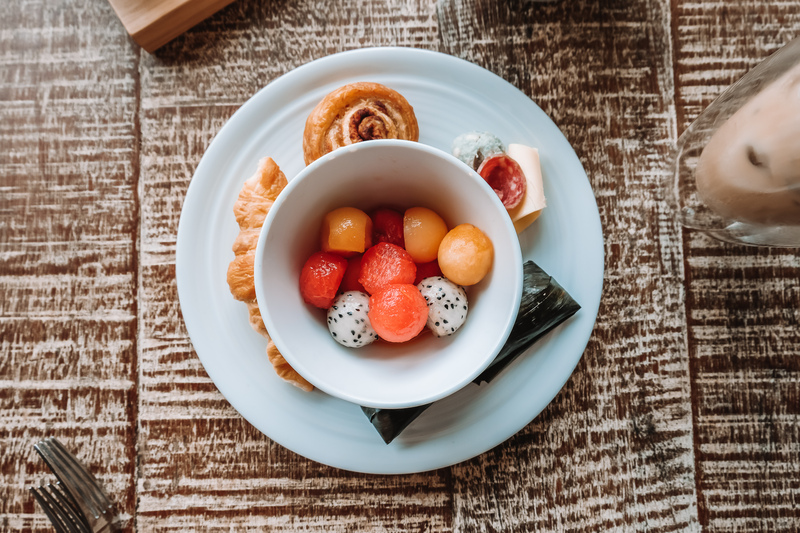 We got our choice of a personal entree and free drink (I opted for iced lattes everytime) and also had access to an expansive breakfast buffet. 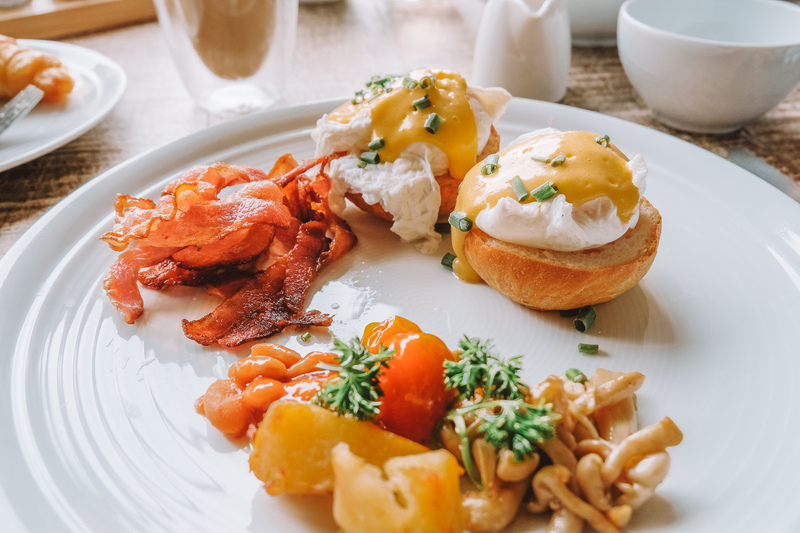 The eggs benedict I ordered were surprisingly delicious, and some of the best I had in Thailand. Dinner was a little more of a toss-up. The first night I ordered a ravioli dish which was a little too salty, but the second night ordered one their specials, a duck dish, which was much better. I can’t remember exactly what we got for dessert but I do remember that they were delicious so I would recommend treating yourself (that’s what places like this are for). Eggs Benedict, spoils from the breakfast buffet, and fried rice. The staff operated at the level you’d expect from a resort in this price range. That is to say, extremely friendly and hospitable. The only complaint I have is that we were a little bummed that when we stayed there wasn’t an option to dine-in our villa with room service. It seemed like such a shame and a waste of the adorable cafe table on the first floor of our treehouse. Not to mention, privately dining in our villa would’ve been a lot more romantic! However, I’ve seen that they’ve seen added in-villa dining as an option on their website, so I’m assuming that reflects a new policy change. 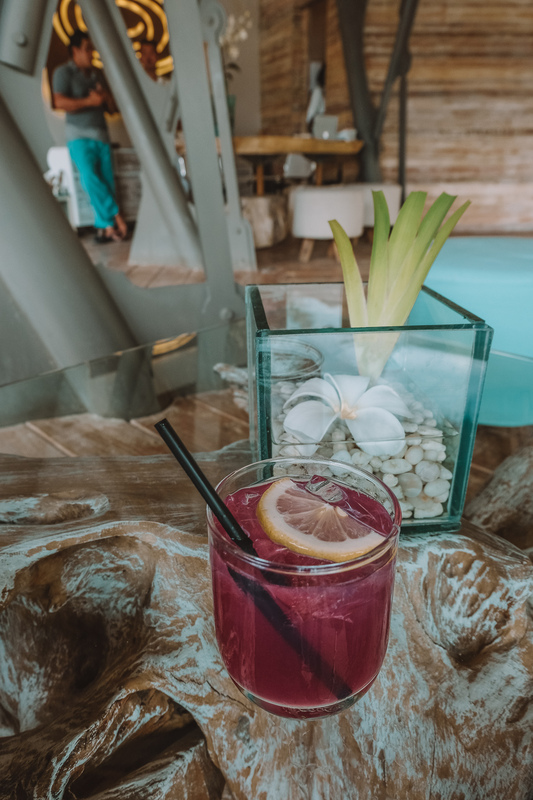 Welcome drinks at check-in and complementary locally-sourced liquors in your Treehouse. 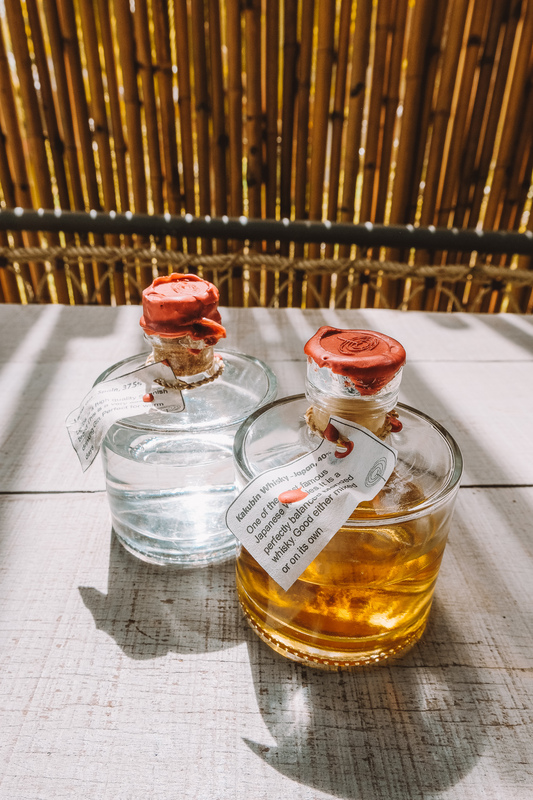 One really cute service amenity was the complimentary bottle of locally sourced rum or whiskey which you can find on the shelf of the bar in your personal villa. All the drinks in the mini-fridge are also complementary so you can mix rum and cokes to your heart’s content! If you read the Check-In portion of this review you’ve probably that Treehouse Villas is not the most accessible site. It’s probably a little bit easier if you’re willing to pay for that private transfer than winging it on a public ferry. The roads on the resort itself are all dirt, which is something to keep in mind for visitors who use wheelchairs. 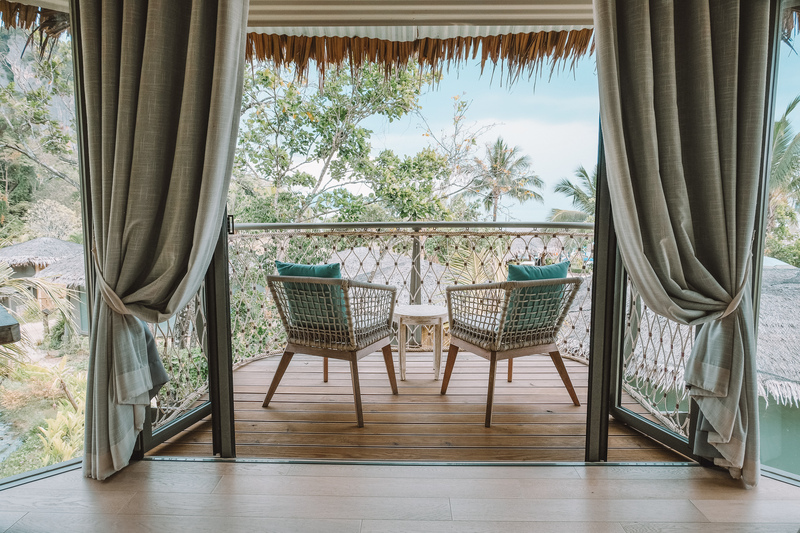 The good news is that not all of the villas at Treehouse Villas are two stories— in fact, the one story villas are the ones that get to be situated directly on the beachfront and the included pools are also slightly bigger. 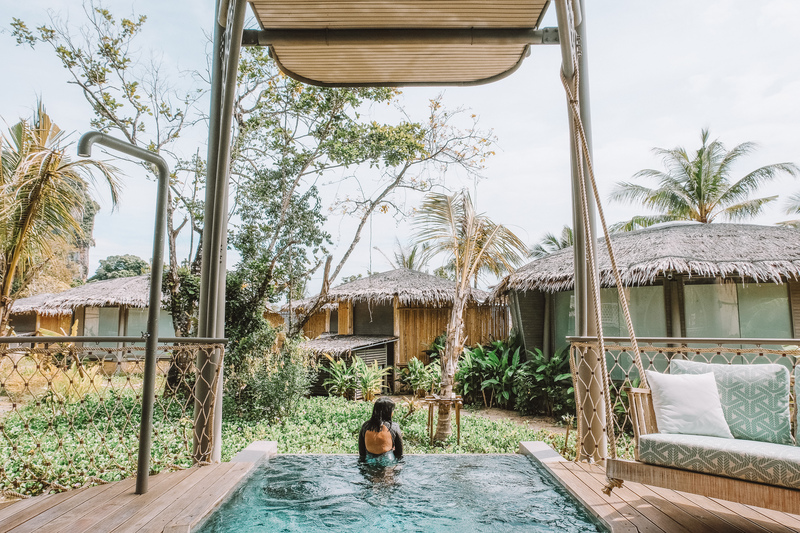 You can find more information on the one-story pool villas <a href=”https://www.treehouse-villas.com/koh-yao-beachfront-pool-villa-room/en” target=”new”>here</a>. It's also worth noting that Treehouse Villas is an adult-only resort and therefore not the most family friendly. 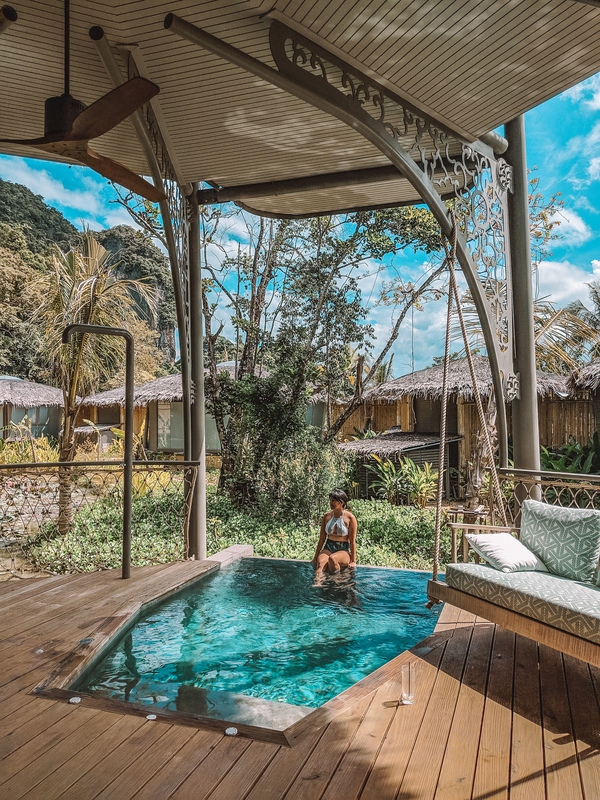 Families should consider staying at the sister resort, Paradise Koh Yao. An attempt at using my drone. 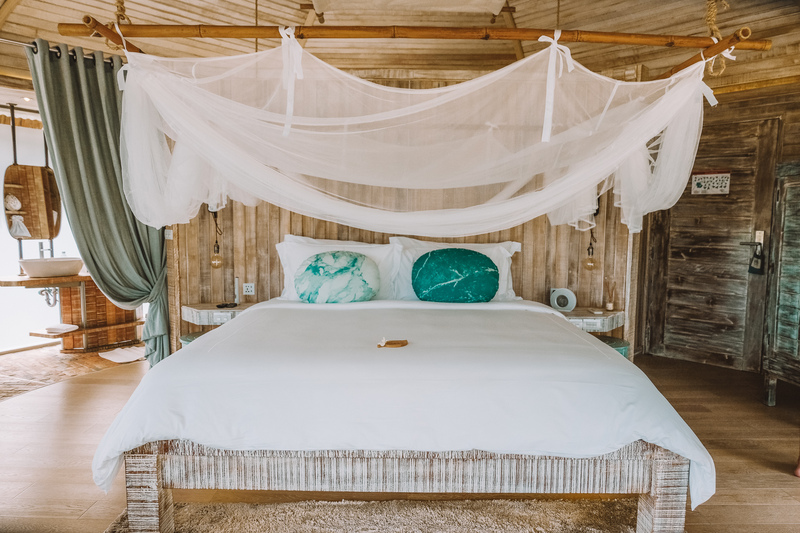 At it's price point, Treehouse Villas isn't the type of place I would gushingly recommend to everyone and for every occasion. 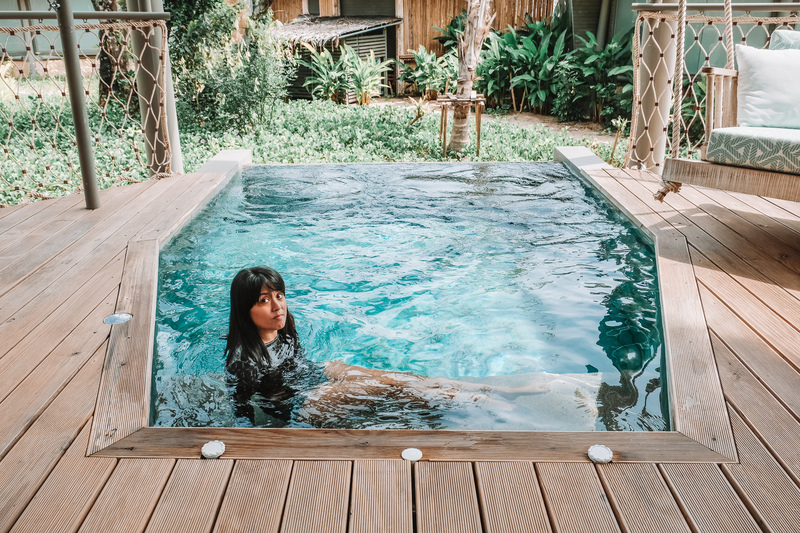 However, if you feel like you've got something special you want to celebrate and you want to get some mileage out of your credit card points, I think Treehouse Villas gives you a lot of bang for your buck in terms of value. 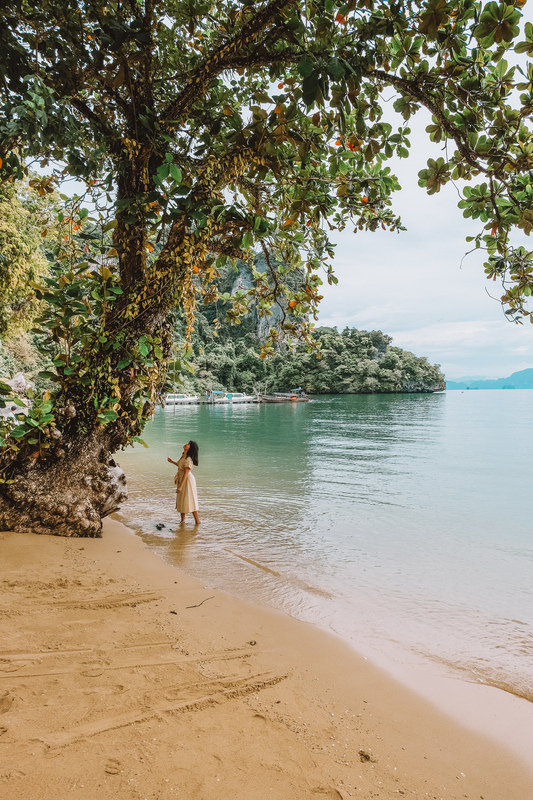 It's also a great option for anyone who's interested in doing the Southern Thailand island-hopping thing but also wants to avoid the more crowded and developed islands, or at least get a few days of remote R&R after dealing with the crowds on Phuket or Ko Phi Phi. If this review was helpful, please use the link below to book your stay at Treehosue Villas, or any other hotel. The InnBox may earn a small portion of sales at no extra cost to you.